There have been a couple very sad occurrences this week which are weighing heavy on my heart. 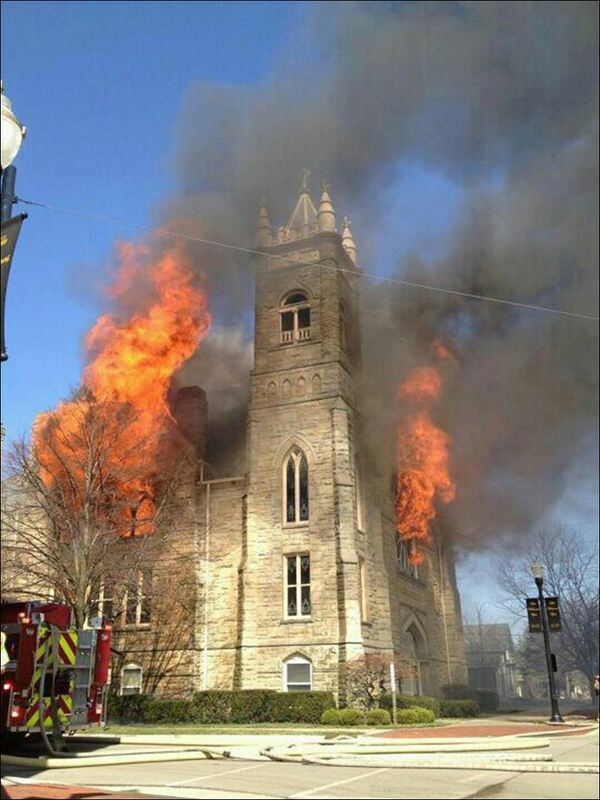 First, on Tuesday I received news that my college church building was burning down. Seeing the pictures (sample below) absolutely broke my heart and brought tears to my eyes. It was a beautiful historic building, and I have a lot of fond memories tied to it. It makes me so sad to think of that poor congregation, with their church home in ruins. Second, I found out yesterday that a high school friend, Ronnie, passed away (seemingly unexpectedly) on Monday. This news is so devastating. I don't know the cause of death. Ronnie was an awesome, friendly, funny guy and liked by everyone. He left a young daughter. I hadn't talked to him much since high school, but the news hit me in the gut nonetheless. My high school class was a small one where everyone knew everyone, and many of us have kept in touch through Facebook in the ten years since graduation. It is just so crazy to see that he was posting on Facebook on Friday, then Monday he was gone. I will never understand the Lord's ways. Toddler Bullying - Does It Really Start Already?